The benchmark BSE index pared more than 1 percent earlier slide, lead by large falls in state-run fuel retailers after a populist move to cut petrol prices for the first time in three years, and closed 0.63% lower. State-run retailers, which typically alter their fuel prices in tandem, cut petrol prices by about 3.2% on Wednesday, in a move seen helping to curb close to double-digit inflation. Construction, engineering and power stocks were battered amid fears of a widespread demand slowdown as 13 interest rate increases in the past 18 months failed to tame near double-digit inflation. The main 30-share BSE index closed down 106.8 points at 16,775.87, its lowest close since 18 October, with 19 of its components closing in the red. The benchmark has been one of the world’s worst performers so far this year, falling 18.2% on slowing growth. “The market is likely to be held in this range for a while, as investors see less value at the top end, but are willing to take a risk at the lower end," said Deven Choksey, chief executive officer at K.R. Choksey Shares & Securities. Shares in state-run Hindustan Petroleum Corp (HPCL) plunged as much as 9.2% to its lowest since May 2009, while larger rival Indian Oil Corp (IOC) slid to a more than two-year low. Bharat Petroleum Corp (BPCL) also fell to its lowest level in 18 months intra-day, before paring losses in line with the market. Shares in HPCL closed down 5.1% at ₹ 286.20 ($5.65). IOC shed 2.8% to end at ₹ 267.90, while BPCL shares ended at 515.95, a fall of 4.2% on the day. Larsen & Toubro, India’s largest engineering conglomerate, and state-run power gear maker Bharat Heavy Electricals (Bhel) were two of the biggest fallers in the benchmark index, ending at their lowest close this year. Both firms cautioned on order book inflows for the current fiscal year to March 2012 as part of their September-quarter earnings announcements. Shares in Larsen shed 4.0% to close at ₹ 1,236.50, after falling as much as 5.0%. BHEL ended at ₹ 298.20, down 3.6%, having fallen as much as 7.4%. 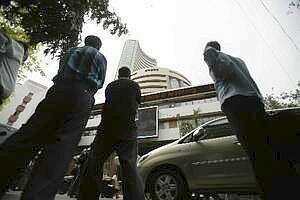 Automakers Mahindra & Mahindra, Bajaj Auto and Tata Motors saw their shares rise, riding on the petrol price cut. Shares in Mahindra closed up 2.1% at ₹ 775.25, while those of Bajaj ended at ₹ 1,725.70, a rise of 0.6%. Tata Motors shares also rose 0.6% to ₹ 182.30. Tech Mahindra, India’s fifth-largest software services firm, saw its shares regain some lost ground having fallen as much as 3.2% in early trading. It closed 1.6% lower on the day. The firm warned of a slowdown in spending in Europe, the second-biggest market for India’s $76 billion IT industry, in its quarterly earnings presentation late Tuesday. Shares in troubled airliner Kingfisher Airlines, whose debt woes have underlined the margin pressures on many Indian firms, closed up 14.2% at ₹ 24.90. The stock is down around 70% from a year ago. State Bank of India, the country’s top lender, which has large exposure to Kingfisher debt, bounced back from the previous session’s fall and ended up 2.1% at 1,765.95 rupees. The 50-share NSE index closed down 0.75% at 5,030.45 points. In the broader market, decliners outnumbered gainers in the ratio of 2.4:1, with about 680 million shares changing hands. Asian markets fell on Wednesday, with European shares following suit in early trading on intensifying concerns that the region’s sovereign debt crisis could spread to France and Spain, with Italy being further sucked into the turmoil. Among Asian markets, the MSCI’s measure of markets other than Japan closed 1.3% lower, while Japan’s Nikkei ended down 0.9%. Steel Authority of India Ltd fell as much as 6.1% after the state-run steelmaker was removed from the MSCI India Index as the equity analysts performed their semi-annual indices adjustments. Everonn Education fell as much as 19.9% after traders told Reuters that Dubai-based Varkey Group’s open offer for the learning solutions provider, scheduled to open on 16 November would get delayed. Sintex Industries fell as much as 9.3% after Goldman Sachs removed the plastic processing firm from its conviction buy list on account of European exposure and foreign currency convertible bonds concerns.